Need appetizer, lunch, or some serious snack inspiration? 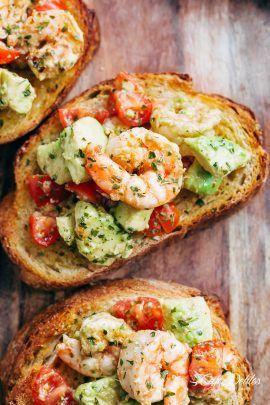 Shrimp Avocado Garlic Bread would have to be the next BEST thing to garlic bread! Combine garlic, paprika, lemon juice and shrimp in a bowl and mix well to combine the ingredients. Add salt to season (to your tastes). Drizzle about a teaspoon of oil into a large frying pan or skillet. When pan is hot, and the shrimp and cook for about 3 minutes on each side, until no longer opaque in colour, and cooked through (being careful not to overcook them). Take off the heat and add the parsley. Set aside to cool slightly. Combine the avocado, tomato, lemon juice and salt in a bowl, mixing well to combine. Add the shrimp, and fold through gently. Spoon shrimp and avocado mixture onto toasted garlic bread. Serve warm or slightly cooled!